This Sunday, at my own exclusive petite soirée attended by just The One, our very in-the-know entertainment publicist friend, Ellen, and moi, I want to sidestep the usual lineup of smarmy suspects for Academy Awards party fare. We have a close friend who’s a Hollywood event planner, so I’ve seen and heard it all, from the divine to the ridiculous. And I’ve devoured just about every permutation of show chow at glammed-up (or, worse, funked-down) NYC parties, including Oscar-shaped grilled cheese-and-bacon-sandwiches, glittery gold-leaf desserts, and black-tie nibbles (read: nothing but black-and-white food, such as caviar and sour cream on squid ink blini). And, of course, anything served on silver plates so guests could admire themselves almost as much as their favorite egomaniacal nominees. This year, I’m going for something a little easier, a little less forced. To come up with possible dishes I played a game of word association, or rather, nomination association. It went like this: Renee and I faced each other, and she shot the name of a nominee at me. I said the first recipe that popped into my head, based upon my vast, deep, and preternatural understanding of every recipe and every last piece of minutiae on this site. So, here’s a warped look into my head for what I’m considering as possible dishes to wrap a menu around for our 82nd Academy Awards dinner. What horrible things big business does to our food. My first thought: pure spring water drunk leaning over an outcropping and slurping it up with my hands. Since we don’t have that on the site, I opted for a Lyonnaise Salad. You can still have your lettuce, your lardons, and your eggs—and eat them, too. Just buy organic, organic, organic—locally, natch. A British professor in Southern California is still mourning the death of his lover eight months after the fact. The film depicts the day he chose to kill himself. Colin Firth’s orderly and dispassionate approach to his own death is perfectly suited to…Crumpets. Pip, pip, and stiff upper lip, old chum. A band of ruggedly handsome men go for nothing less than bringing down Hitler—Quentin Tarantino-style. That means lots of perversely compelling blood and guts. The obvious choice would have been blood-drenched rare steaks, but my mind went for the more sanguine choice of Blood Oranges, Dates, Parmesan, and Almonds. Even the Bloody T-man himself might get a kick out of that. A documentary about the shocking and chilled abuse heaped upon dolphins for the benefit of the aquatic entertainment industry. Utterly shocking. Another no brainer: Something entirely ocean-safe, Tapenade Trio. A young girl is murdered. From beyond the grave she helps lead her father to her killer. There’s no bone lovelier than the one running through these Slow-Cooked Lamb Shanks in Pinot Noir. If you don’t know the movie, you shouldn’t be reading this blog. My first thought: coq au vin…which we featured two weeks ago. So that was out. Then, anything French with “buh-terrrr,” as Meryl Streep purred in the film. But one of Child’s own dishes, Steak au Poivre, popped into my head. A white family, led by a cojones-busting momma, takes in a young black man who goes on to shine as a football player. With all that testosterone Sandra Bullock exudes, I immediately thought of Tony Bourdain, but in a tutu. So I picked his Floating Islands with Black Currant Sauce. An animated feature about, well, a house that lifts off because of all the balloons attached to it. (Sorry, didn’t see it.) But you gotta love my association: Double Chocolate Soufflé, with all of its glorious egg-white rise. 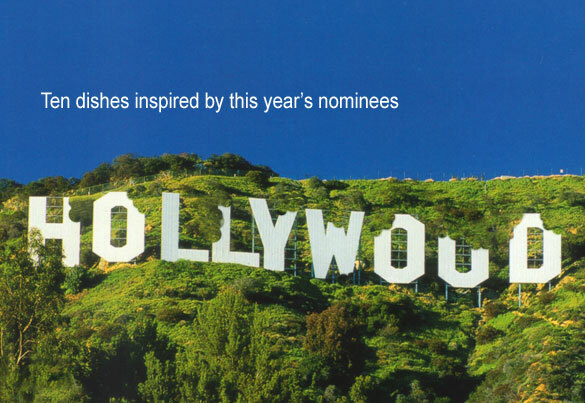 When you look at the nomination list, what do you think of immediately? Tell us, and if we have it, we’ll add it.